It’s the pre-dawn hours, and you roll out of bed to fire up the truck with plans to sneak in early morning turns before work. The stage is set for an amazing day with overnight accumulation that continues to drop as you barrel down the highway to first tracks with friends. The excitement is palpable while HUGE flakes cascade out of the sky as you pull off, donning all the necessary equipment to venture into the mountains. All of a sudden reality comes crashing down and your heart plummets as you become acutely aware of your ski boots, sitting warm back at home right where you left them the evening before. Depression begins to set in as you envision the rest of the day at work going through powder withdrawals. Your friends navigate their own internal strife, to leave you behind or stay and call the morning off entirely. Awkward, right? It happens to the best of us, and hopefully for some, it is a lesson only learned once. Spend enough time skiing and it isn’t an “if" but rather a “when” situations like these take place. When that fateful day comes and your hopes and dreams of skiing fresh pow don’t come to fruition, crippling sadness sweeps over you and many will wonder, "How did this happen?" The reality is we are all human and we make mistakes. As cliché as it sounds, it’s what we do to learn from these hard lessons that fortify our foundation of experience. As Ed Viesturs' book, “No shortcuts to the Top,” articulately conveys, moments like these are more of a rite of passage than a display of incompetence. Luckily, there are tools that help minimize the potential for difficult lessons like these to be learned more than once. There is little room for error when assessing the amount of equipment required to keep us safe when navigating the unforgiving terrain the mountains provide, especially when referring to the art of backcountry skiing. Checklists, for myself and many other outdoor professionals, are a vital step in morning rituals that rarely deviate from routine. Everyone carries different things in their pack, but there are a variety of items that earn a spot on the checklist no matter who you are. Living a coffee-free life, these tools keep me on my game and ready to tackle anything the mountain has to offer when getting up at those ungodly hours. 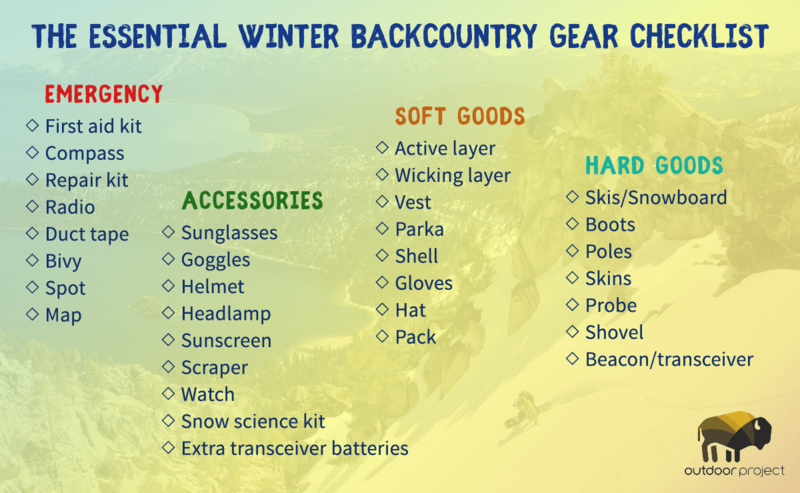 Without further ado, let's dive into what items populate my Backcountry Gear Checklist! Although this is not designed to be an exhaustive list of every component and piece of gear I carry in my bag, it does a good job at highlighting the necessary items for any tour - no matter the gravity or duration. Accidents happen, and its best to be prepared when they do. Pieces of gear such as repair kits, first-aid kits and my personal favorite - the “Oh Sh*t Kit” - have many different configurations based on the gear used and personal preferences. As the old adage goes, “It’s better to have it and not need it, than to need it and not have it” (within reason). Thanks for taking the time to get educated on how to stay safe in the backcountry, and have an awesome winter!! Over the course of the season I will develop a variety of blog posts going into more detail about each item, so stay tuned. Now get outside, have fun, and stay safe out there!